Going to college is an exciting time in a young person’s life. It is a time for gaining new knowledge and experiences, both inside and outside the classroom. 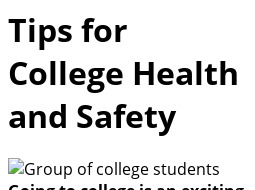 Here are a few pointers for college students on staying safe and healthy.